Many social reasons have been given for having children, such as having company and/or someone to take care of you in old age, passing on legacies or customs, and merely heeding natural physical instincts. All these reasons have some validity. However, from a gospel perspective, there is one reason that matters above all: We have children so that their spirits can gain bodies, and then we are charged with caring for and guiding them through their mortal experiences, helping both of us to grow and become more like our Heavenly Parents. 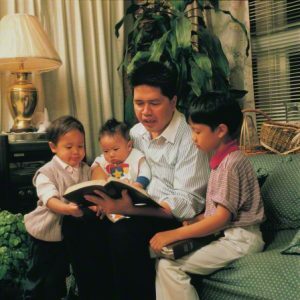 A father reading to his children. Courtesy of the LDS Media Library. In modern days, raising children is increasingly seen as little more than a hobby that some people like and others do not. Some have also promoted the notion that having children should be made into competition in which the prize is racial, cultural, or religious dominance, reducing the souls of God’s children to trophies, to the detriment of the children themselves and the societies in which they live. 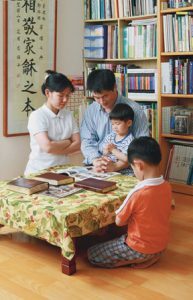 Treating children as anything other than precious individuals whose spiritual journeys we are privileged to facilitate is not only contrary to gospel doctrine but constitutes serious sexual transgression, as it insults the powers of creation and distorts the true purpose of parenthood and life itself. Church members are discouraged from entertaining such selfish and prideful motivations for forming families. Family Prayer, by Hyun-Gyu Lee. Courtesy of the LDS Media Library. Procreation and parenthood must be acts of love above all else, and violators of such doctrine risk great offense against God and destruction upon their spiritual brothers and sisters. True growth of God’s kingdom will be found in strengthening the spirits of Church members and not in merely adding to our numbers.